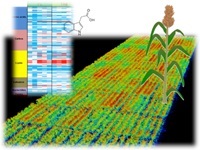 If successful, the PNNL team will develop an integrated phenotyping solution to accelerate bioenergy plant breeding by identifying the traits needed to yield greater amounts of biomass from plants able to withstand greater environmental stress. Increased use of biofuels could significantly reduce CO2 emissions from transportation, and improved varieties of biofuel crops could use less water and be more resistant to environmental stress. The CASP team is seeking to develop high-biomass sorghum with superior drought/salinity tolerance. The team uses a multi-modal sensor suite of LiDAR, multispectral cameras, and thermal cameras mounted on an unmanned aerial vehicle (UAV) to detect traits indicative of improved yield and drought tolerance. Data-processing software then translates UAV-based imagery into plant trait measurements. To link the phenotypes observed to specific DNA sequences, the team has applied large collections of diverse sorghum germplasm for genome-wide association studies to field phenotypic data and identified over 200 genetic markers associated with drought tolerance and/or biomass accumulation. This information allows researchers to more confidently identify genetic markers associated with the traits measured and identify genes specific to plant life stage. In 2017, the team completed a proof-of-concept project on field corn with a major U.S. seed company, collecting data over breeding trials and demonstrating the successful collection of plot-level traits. The UAVs developed by Blue River Technology (BRT), a member of the CASP team, can produce field maps that provide breeders and growers with unprecedented insight into crop and plant health. In 2017, John Deere acquired BRT for its expertise in applying computer vision, machine learning, and robotics to agriculture. For a detailed assessment of the PNNL project and impact, please click here.